In Buffalo, Tattoo Removal is performed at the Aesthetic Associates Centre by Dr. Shatkin and his award winning team of health care experts. 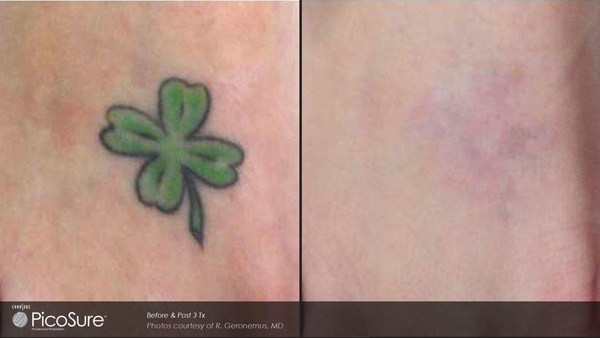 Dr. Shatkin and his staff erase unwanted tattoos and pigment with PicoSure, the most advanced laser treatment available for safe and effective tattoo removal. PicoSure targets unwanted ink more effectively than ever before, successfully removing difficult ink colors, such as blue and green, as well as previously treated tattoos. Fewer treatments, improved recovery time, and faster results are achievable with PicoSure’s groundbreaking picosecond technology. The number of laser treatments needed for tattoo removal is dependent on a number of variables such as ink type, size of the tattoo, type of laser used, lifestyle habits, etc. During your consultation at the Aesthetic Associates Centre, either Dr. Shatkin or his staff provider will evaluate your tattoo and recommend a realistic treatment regime to help you achieve the best results.